We are officially stuck in the '70s here at Cardboard Appreciation. Not that I'm complaining. Ringo Starr is singing "Photograph" as I write this. 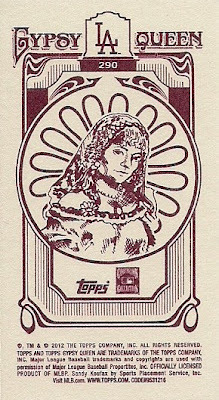 But there have been three cards voted to the next round of Cardboard Appreciation, the Review 3 so far, and all three have been cards from the '70s. 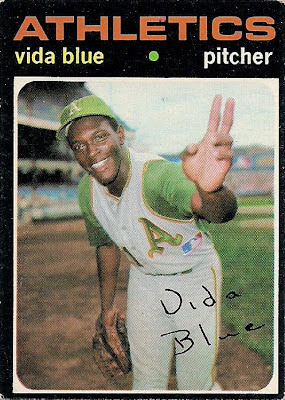 Vida Blue's classic first solo card from 1971 is the latest card to get the '70s royalty treatment. In what I knew would be nothing but a rout, Blue dominated the competition to join the '73 Frank Robinson and '77 Gary Carter in round 2. As Billy Preston asked back in the '70s, "will it go 'round in circles?" The Blue card definitely does. And it'll fly high like a bird in the sky, too. 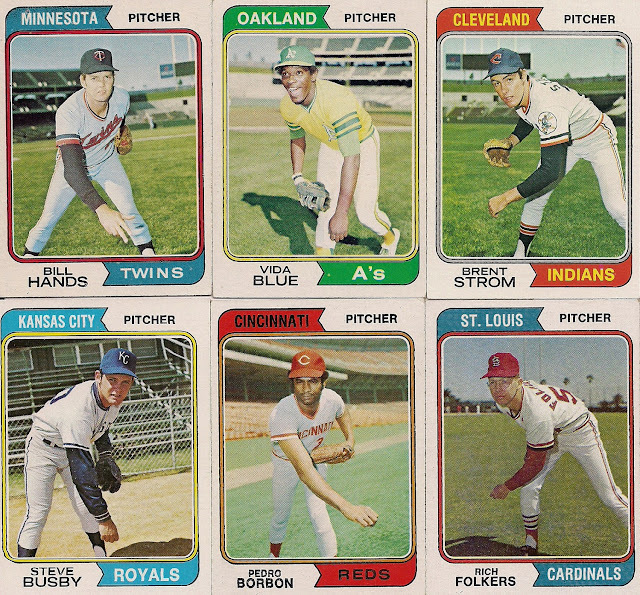 It's very possible the '70s trend will continue for another week with the latest grouping of cards that need your vote. You'll know what I mean when you see the cards. 1. 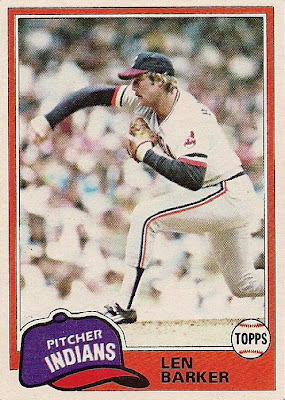 1981 Topps Len Barker: Once upon a time, I thought a cool card was a harbinger of great things for that player that season. 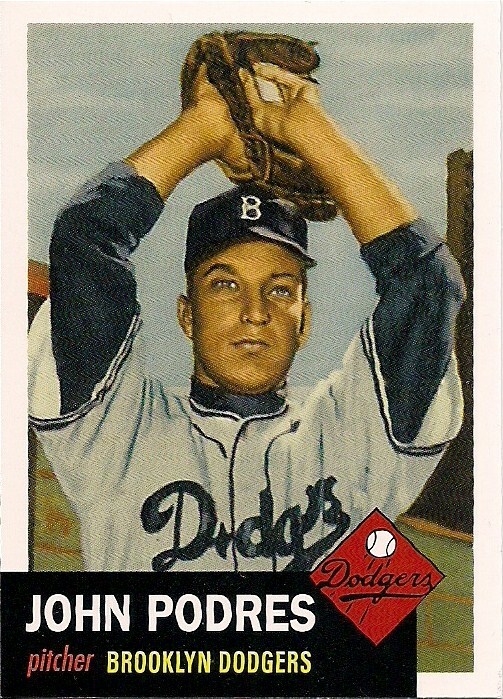 Len Barker proved this flimsy theory by throwing a no-hitter the year this card came out. But then how do you explain all the lousy cards Mike Schmidt had? 2. 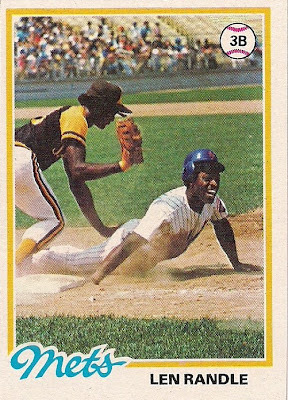 1978 Topps Len Randle: SeewhatImean? 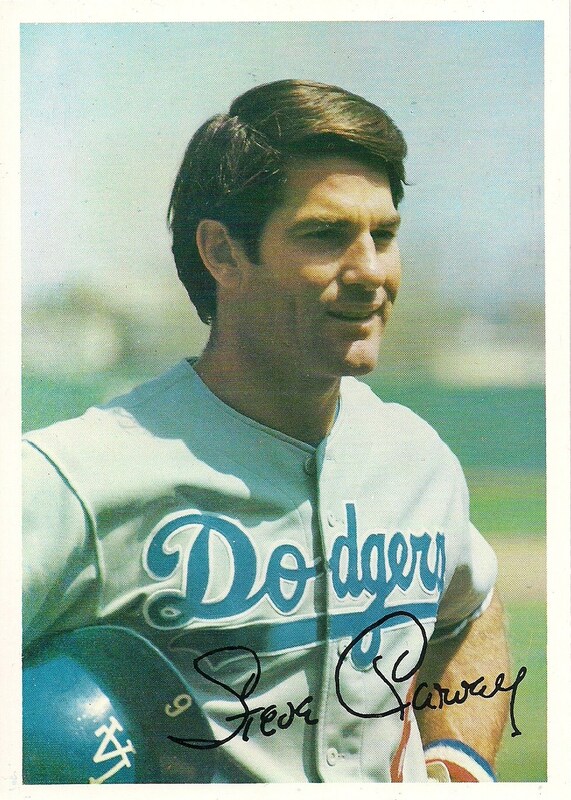 Another great '70s card. 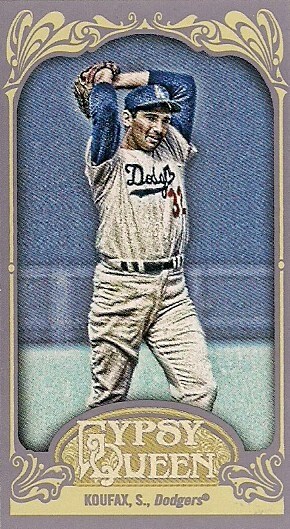 I've written about this card at least twice on this blog and documented the play depicted on the card each time. So I'm not going to do it again here. If you're late to the party, that's why there's something called "Night Owl Archives" on the sidebar. 3. 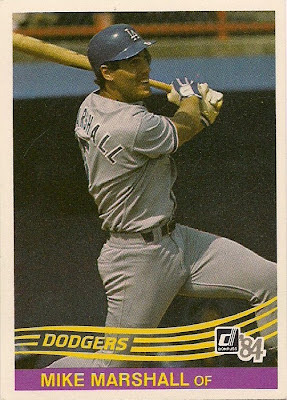 1984 Donruss Mike Marshall: Part of being a fan -- a true, dedicated, foul-weather fan -- is sticking with your team through playoff disappointment, horrible seasons, bad trades and players who don't quite fill their vast minor league potential. But you didn't have anything to do with that, right Mike? 4. 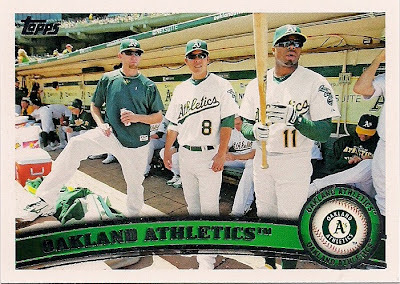 2011 Topps Oakland A's: OK, I'm going to "hoot" about this particular Cardboard Appreciation post a little. I like it. It's one of my favorites. It takes me to the heart of one of the things I enjoyed the most about baseball when I was a kid. So I'll be nice and link this particular post. 5. 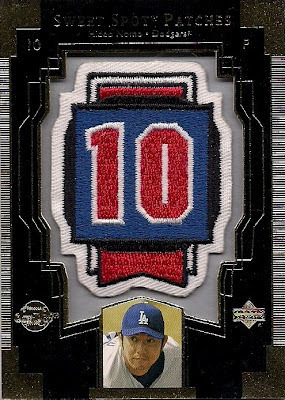 2003 Sweet Spot Patches Hideo Nomo: Some of you may not even consider this a card. That's OK. I was in your camp, too ... until I received this card. And then all of the gold edging and general fanciness made me realize how foolish I was. Not only is it a card, but it's the MOST FANCIER-THAN-YOU-CARD OF ALL-TIME! 6. 1993 Endless Summer Promo Maci Wilkins: This card is going to throw some people who think this vote-off is about the greatest cards of all-time. It's not. It's about the cards in my collection that I appreciate. And what's not to appreciate here? This card was shown as an ode to water parks, and (*ahem*) certain people who frequent them. I will be interested to see how this card does in the poll. 7. 1980 Kellogg's Pete Rose: This card is here more for the back than the front. 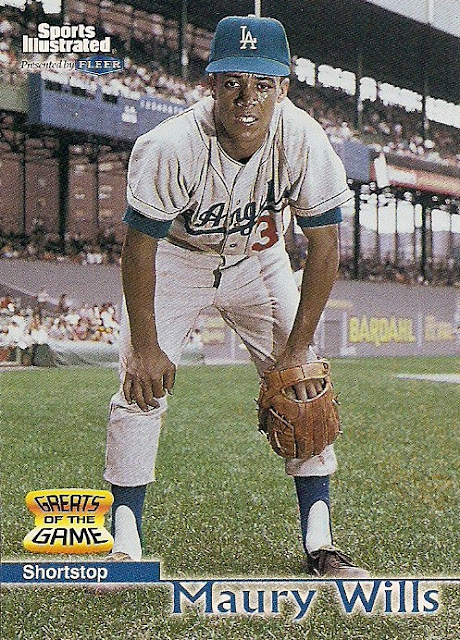 Kellogg's collectors will know that players' hobbies were listed on Kellogg's cards. 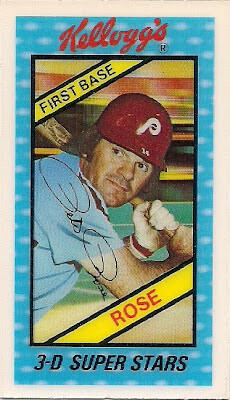 Rose listed his hobby as "all sports," which is odd and also very much like Pete Rose. 8. 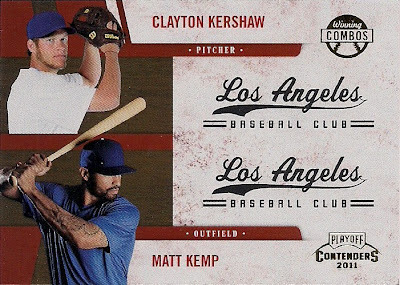 2011 Panini Playoff Contenders Winning Combos Clayton Kershaw and Matt Kemp: Panini, Panini, Panini. What are we going to do with you? 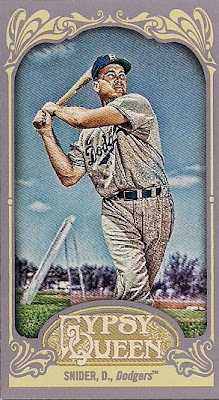 Back when I displayed this card, I held up 1970s Topps football cards as an example of how you create non-licensed cards. Meaning: don't show them in their underwear!!! And those are the eight that you have all week to vote on over on the sidebar, which is now a pleasing sickly green. I call it my Kermit the frog phase. Because I'm a '70s kind of guy. And, if the votes say anything, so are you. I have sold cards at garage sales several times. I don't give cards up easily, especially to random people who may not enjoy them as much as I do. So, the vast majority of cards that I have sold on the front lawn are items that I never wish to see in my home again. Dupes galore. 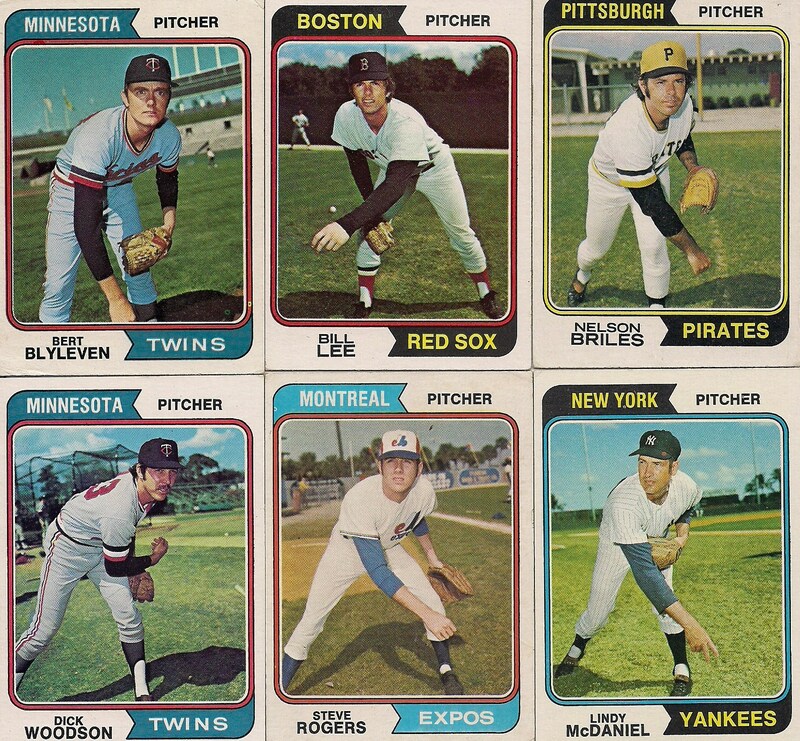 Non-baseball cards. 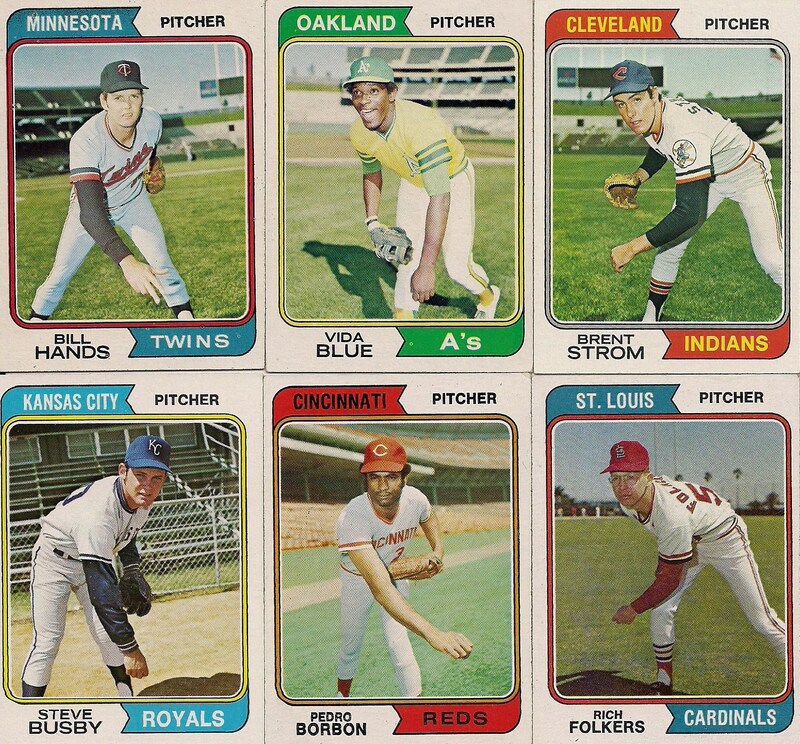 Non-sports cards. Items of that nature. I've experienced regret with what I've sold in a garage sale only once. It was the time I sold the oversized glossy cards from the early '80s. 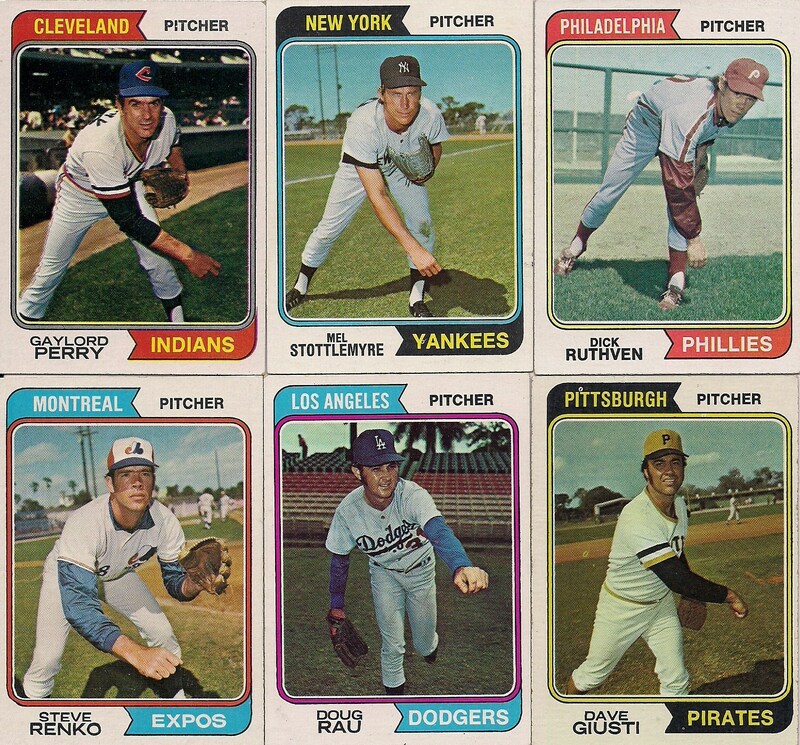 Collectors of this time remember these "cards" with glee. They were 5-by-7-ish (or more accurately, 4 7/8-by-6 7/8). The photos were featured on thick cardboard stock and contained glossy fronts, much as you would see with movie star oversized photos. 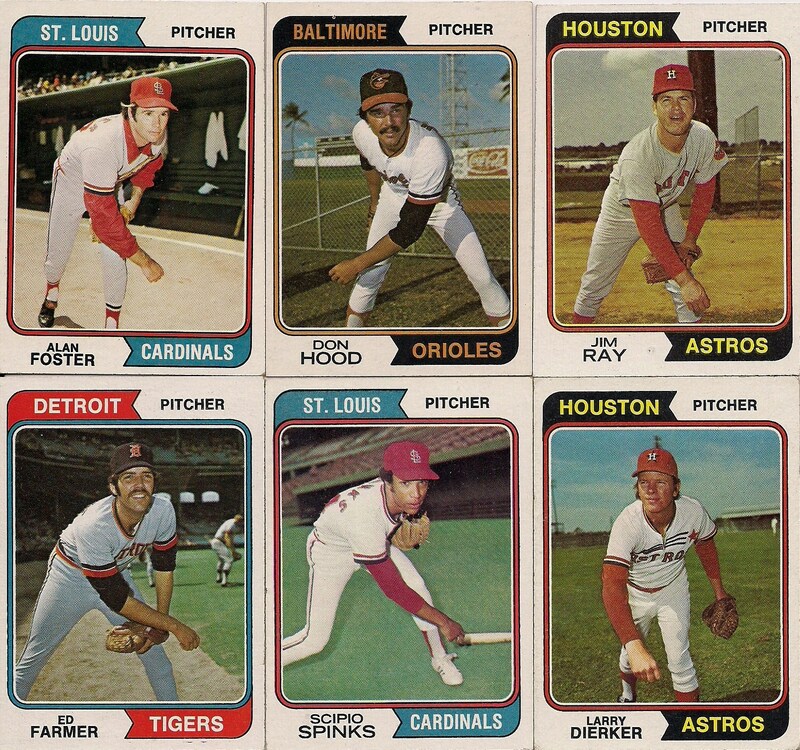 The first time Topps issued these was in 1980. It was a set of 60 and they were sold in one-card packs. The photos came with gray backs or white backs. 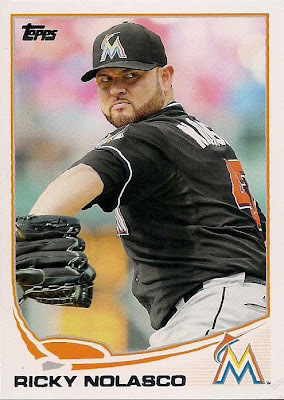 From what I've read in the Standard Catalog of Baseball Cards, the white backs were test-marketed in certain places, rarer, and I never saw them. I saw the gray backs. "Topps For The Fun Of It"
Remember when collecting was fun? 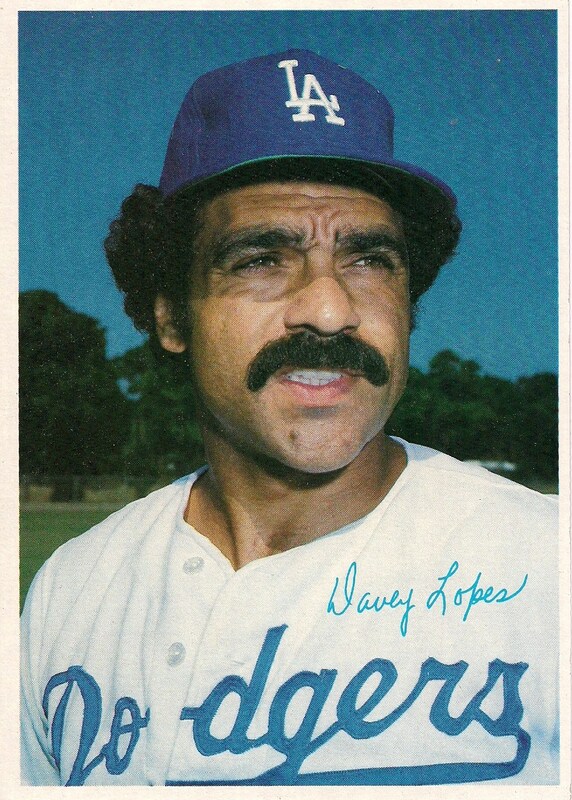 Anyway, you might have noticed that Topps referred to Mr. Lopes by his popular first name of "Davey". This is a rarity. Even though he was referred to as "Davey" everywhere, Topps insisted on calling him "Dave" on its cards. 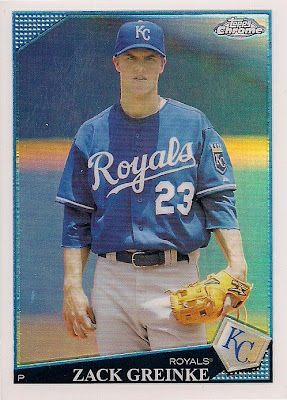 This is the only case that I can find on a Topps card issued during his career in which he is called "Davey." This set is officially called the "Topps Superstar" set. In 1980, I found these cards in a small Greek grocery store that we walked past on our way to the drugstore that sold cards. I don't know what prompted us to go in the grocery store -- I think it's possible that the cash register and counter, where all the cards were, was positioned up against the window and we could see the cards displayed there as we walked past. 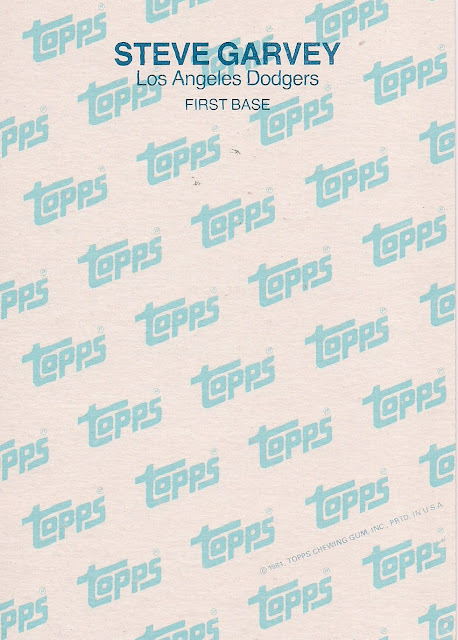 That store became the go-to place for all of our non-base card needs (we didn't refer to them as "base cards" then, what the hell was a "base card?"). We'd go to the drug store with the green store front for our regular old Topps and the Greek store for the oversized photos, stickers and other fun, weird stuff. 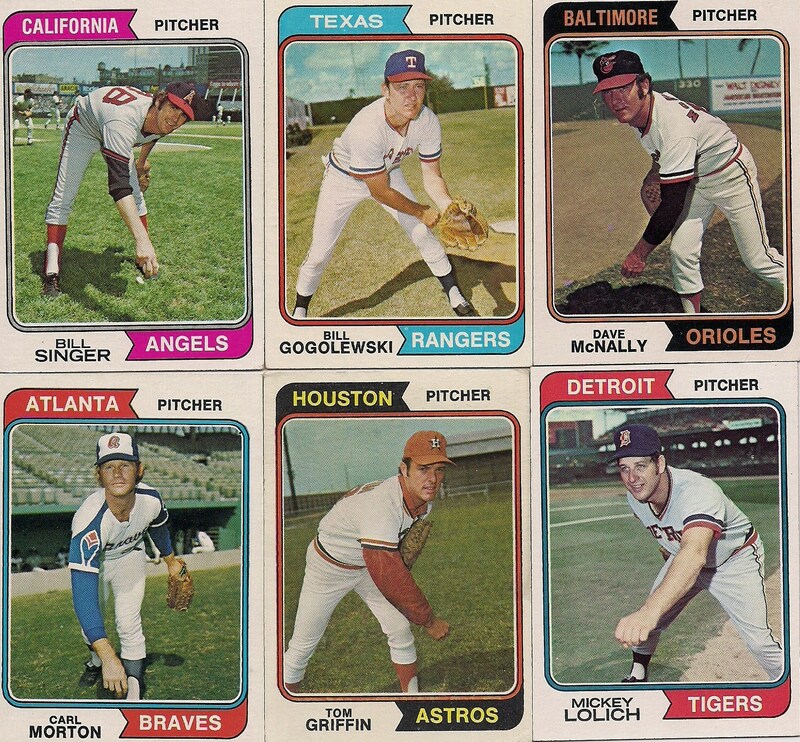 In 1981, Topps issued another set of oversized glossies. It actually issued two sets, but we didn't know that where we lived. One set was a "team set" that featured 102 cards grouped by team. 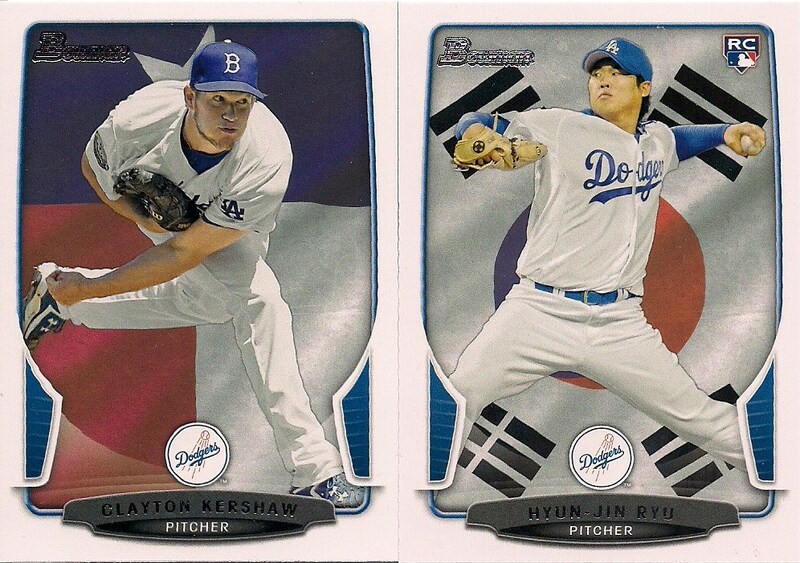 The cards of a specific team were sold in specific geographical areas. So, for example, you could find Pirates in western Pennsylvania and Brewers in Wisconsin. 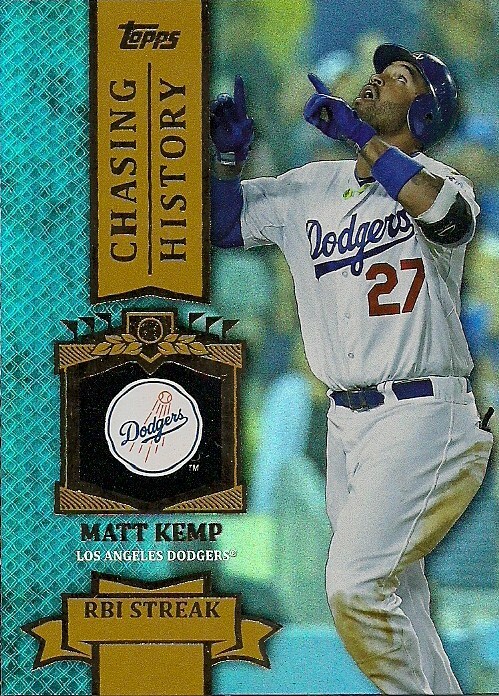 The chances of me in New York State getting the Dodgers glossies were nil, and I still don't have those cards (the Cey card is high on the want list). But we also didn't see any of the Yankees and Mets team glossies. I lived a mere afternoon ride from New York City at the time so I don't understand why I didn't find any. It's probably a good thing I didn't because I might have ripped them up right in front of that nice Greek lady who I didn't understand and start an international incident. No, instead, the cards featured at that store was a separate National set. It was 15 cards and, from what I understand, was distributed in areas where the team sets weren't. I probably obtained maybe half of the national set. This is the only card I have left from that set. I'm assuming it's different from the "team set" Garvey, although I know some photos were repeated between the team sets and the national set. Believe me, it was difficult devoting my attention to these things in 1981. That was the year that Donruss and Fleer arrived on the scene. 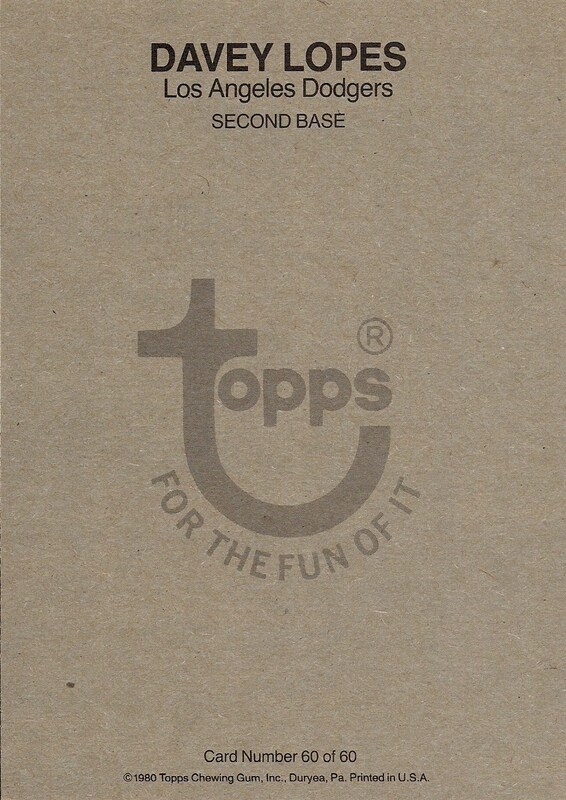 And then Topps, in a desperate bid to pull our attention from those two upstarts, was throwing stickers and glossies at us. And then there was Kellogg's and the special Topps Coke set, and ... goodness, I can only afford so much delivering newspapers!!!!! But that's how fascinating those glossies were. I made the time and budgeted the money to pick up a few. I not only had the Lopes and the Garvey but I remember a Schmidt and a Reggie Jackson and a Carew and a Brett and a Stargell. I even remember a Rick Manning. 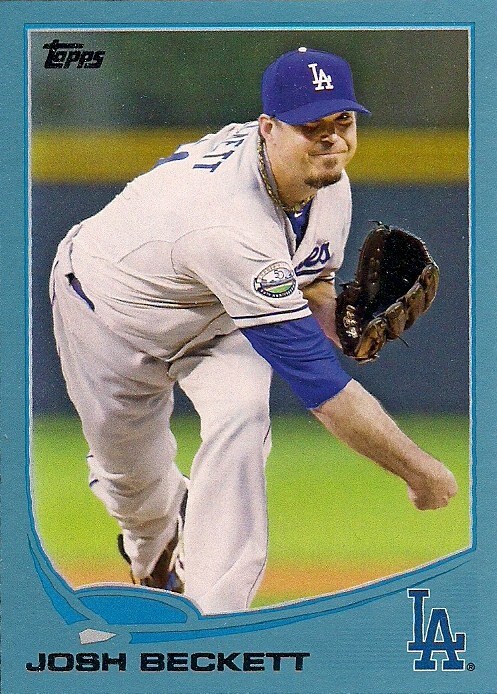 But I sold all the non-Dodgers at a garage sale during my collecting hiatus. I was purging cards that didn't fit -- literally -- in my collection. Oversized cards, especially, were out. What was I going to do with those things? So, into the pile of junk it went to be peddled out of our front porch. The vast majority of cards I have sold in garage sales were purchased by middle-aged women who were either buying for their grandkids or people who told them "find some cards, they're worth money." The glossies that I sold were bought by two men, probably around age 40. They stopped, gave each other a "remember these" stare and bought them. Looking back on it now, I know who they were. They were card dealers. We have a few of them in the area, and had even more back then. They had stumbled across a "find" -- the reason us collectors comb garage sales these days. Amid all of the ratty 1990 Topps found at garage sales, I had provided something a little more interesting and just slightly more valuable. There was a little part of me that knew then I probably shouldn't have given those up. Today, I have the Lopes and the Garvey and that's it. They're housed in special, two-pocket pages that fit those things. 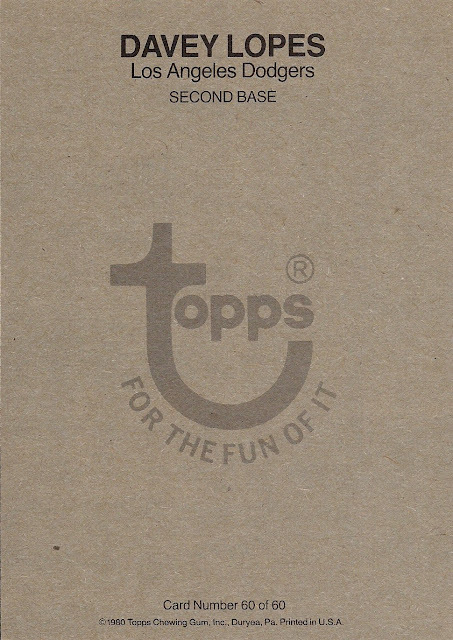 And the pages are in a special binder of Dodger oddballs. I'm not sure why having oversized cards that didn't fit were such an issue then. Today I have a bunch of stuff that doesn't "fit" just lying around in a stack -- or in a different stack -- or in a box -- or on a desk. I guess I'm a lot sloppier now, but I prefer that then getting rid of something cool just because it doesn't look right. That's what 1991 Donruss is for. I keep hearing about some "PWE Appreciation Week" thing happening next week -- send someone some cards in a PWE and let the joy unfold, or some such pleasantry. I'm not going to be able to participate. There's a lot going on around here and even more next week. Package-sending will take a dive. It's ugly, I know. But that's the way it's got to be. Our summers don't last long around here, you know. Got to hit that while you can ... or whatever the kids are saying these days. Fortunately, it's pretty much PWE Appreciation Week every week lately. I've received them and have been sending them out like never before. I already detailed that in an earlier post. Why I just received four PWEs in rapid succession a couple of days ago. I don't have a lot of time today, so I'm going to show them quickly together with less-than-usual commentary. 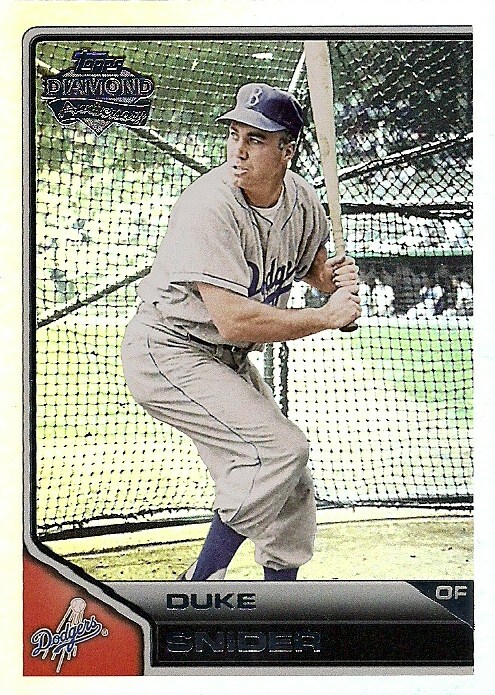 First there is this shiny Duke Snider cards from 2011 Lineage. Remember Lineage? I actually have good memories of chasing that set that summer. 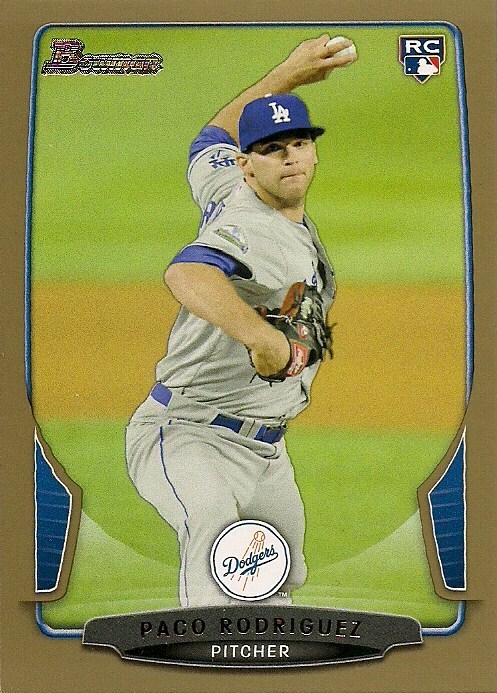 But unfortunately, I still need some Dodger parallels from it. This card was sent to me by madding of Cards On Cards. All of our many packages sent over the years have been in something more substantial than a PWE, so this surprised me. I thought it might be a "cease-and -desist" letter. Stop sending me your Yadiers! This card fell out of a PWE from Ethan at Top Of The Topps. It's the second straight '95 Fleer card he's sent me and yet I still converse with him. 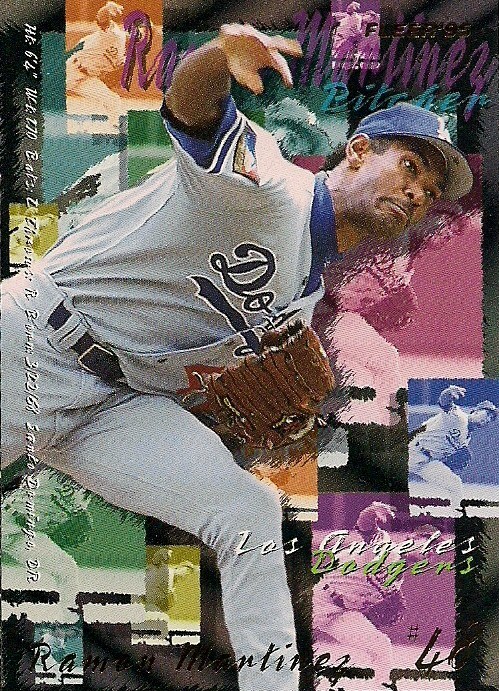 It's also the last '95 Fleer Dodger that I needed to finish the team set. My eyes are much relieved. I also found out from the protective packaging inside the envelope that there is such a thing as "Brown rice and sweet potato" Triscuits. I couldn't be more intrigued. 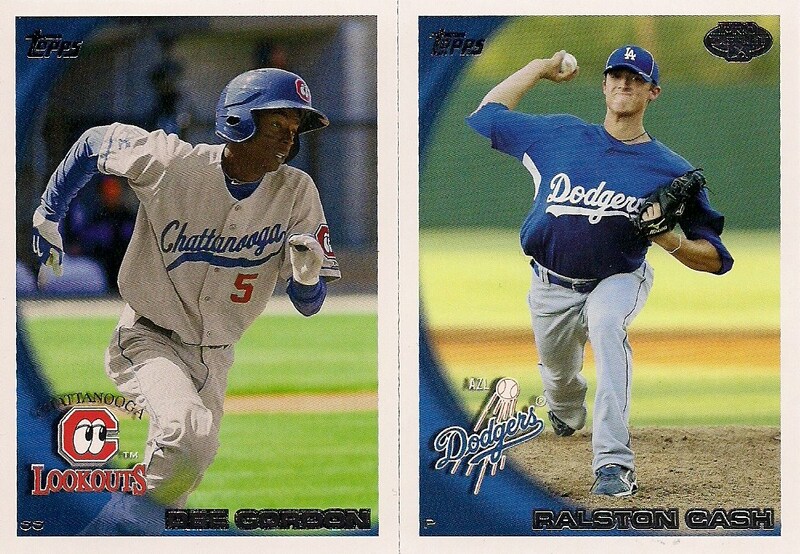 These Pro Debut cards came from Weston of Fantastic Catch. Dee Gordon, I am sure you know. Ralston Cash? He's in his fourth or fifth year of the low minors. Yay, Pro Debut! Weston's trying to wrest a Lance Lynn card from me. And I think he may have been successful. Uh-oh. This guy. I don't think Weston's successful anymore. OK, we're back on track now. You'll always get what you want by sending me a Kershaw card. Finally, a fifth card from a single PWE. Matt Kemp, now that he's back in the lineup, has picked up this habit of slamming inanimate objects with his fist when he's excited. Two days ago, it was a wall. Yesterday, it was the dirt around third base. I wince when he does this and scream things like "Shoulder! SHOULDER!" The final PWE is from Robert of $30 A Week Habit. Paco Rodriguez is the fellow who saved the Dodgers' win over the Giants after League attempted to surrender everything in the most humiliating fashion possible. Beckett has recently started throwing again in his rehab program. Alert me when he starts throwing well. These cards are most appreciated. The International Style parallels are one of the only things I really like about Bowman. Now looking for Mr. Goldie. Many thanks to all four folks for making each-and-every week PWE Appreciation Week. I'm sure I'll be sending out more PWEs after this first round of summer activities quiets down. I'm off to enjoy some right now. This card solves a binder crisis. A few weeks ago, I found a night card to fill the No. 65 spot of my night card frankenset binder. Unfortunately, the card was filled with terrible people and terrible memories. I take my night card binder seriously, so even though I didn't like it -- at all -- I designated that card for inclusion in the binder and wrote myself a little note to turn the page very quickly whenever I reached the fourth page of the binder (yes, I fill both sides of each page, I'm not made of coinage). But there was still hope. 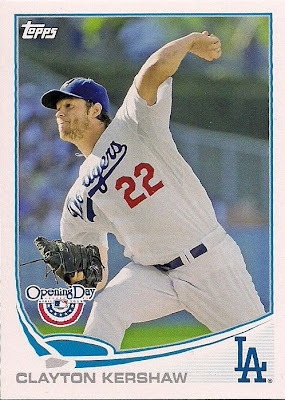 Backstop Cards alerted me to the fact that there was a night card in this year's Opening Day that was No. 65 in the set (Marcus has been helping me out quite a bit lately, I've really got to get that package off to him). It would serve as a suitable replacement. As luck would have it, I finally pulled that card the other day. It's the Will Venable card you see here. What a relief to replace that card with this card. 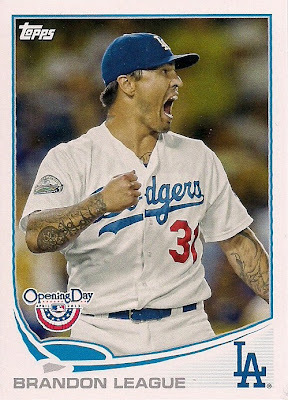 And you know how much of a relief it is if I'm all giddy about a Padres card. I'm not all that up on Will Venable. I know him mostly for being Max Venable's son. 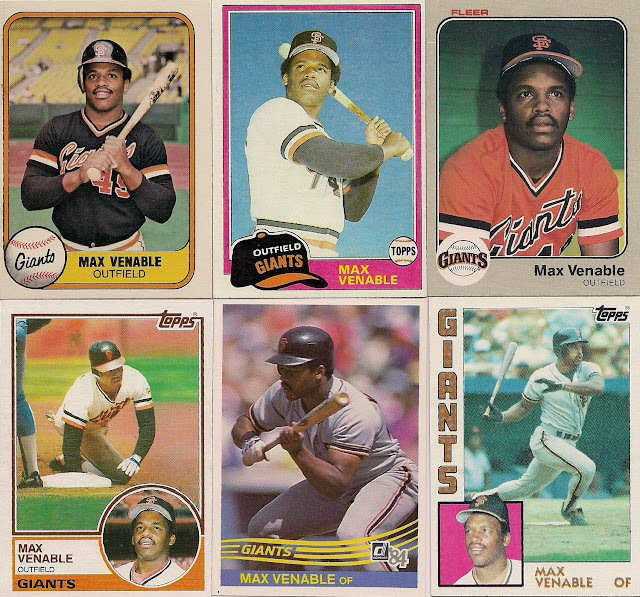 Max Venable, a bench player mostly with the Giants, was one of those nondescript players I collected during the 1980s. He had that cool, base stealers vibe that I thought was appealing during the '80s. There you see some examples of Max (the Venables have this nasty habit of playing for teams I do not like). Max Venable went away for a little bit. Well, OK, he didn't really go away. 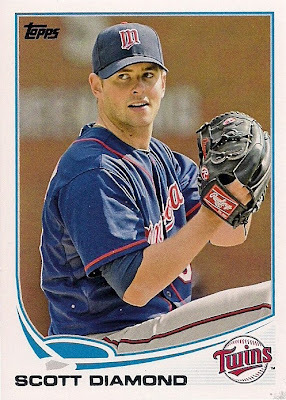 He was dealt to Montreal in the deal that sent Al Oliver to the Giants. Venable spent much of the 1984 season in the minors. 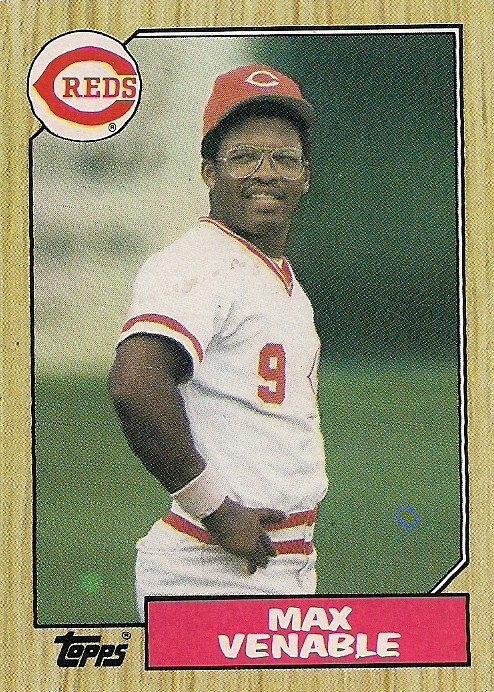 And although he played 38 games for the Expos that year, neither Topps nor Donruss nor Fleer deemed it worthy enough to make a card of him in their respective 1985 sets. 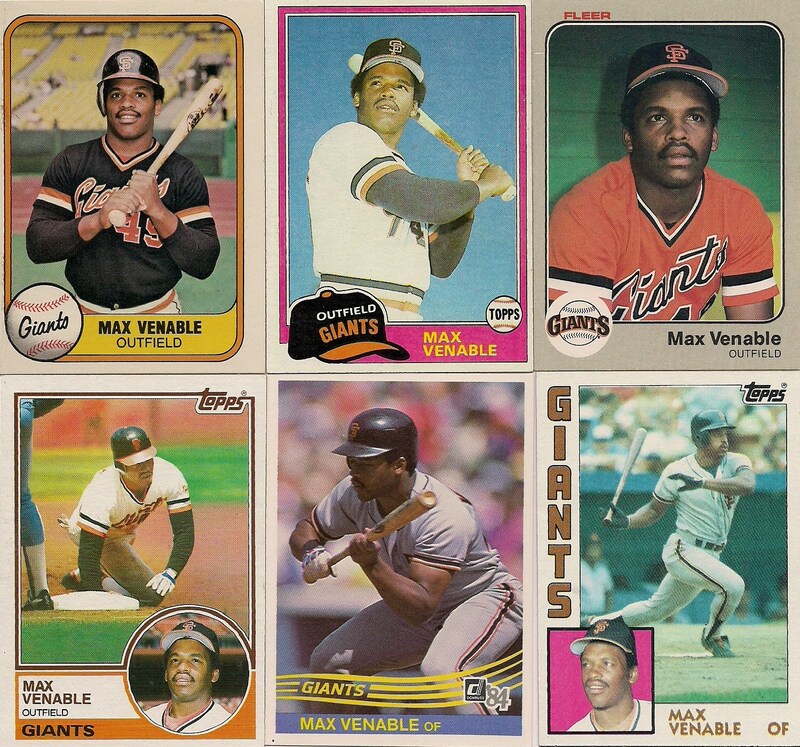 So, when no Venable appeared on 1985 cards, it was like he went away. Topps, Donruss and Fleer considered him a nonentity. That was good enough for me. Then Venable turned up again in 1986. He was with the Reds now and he looked ... different. There's nothing quite like 1980s eyewear frames to sap you of all your coolness. 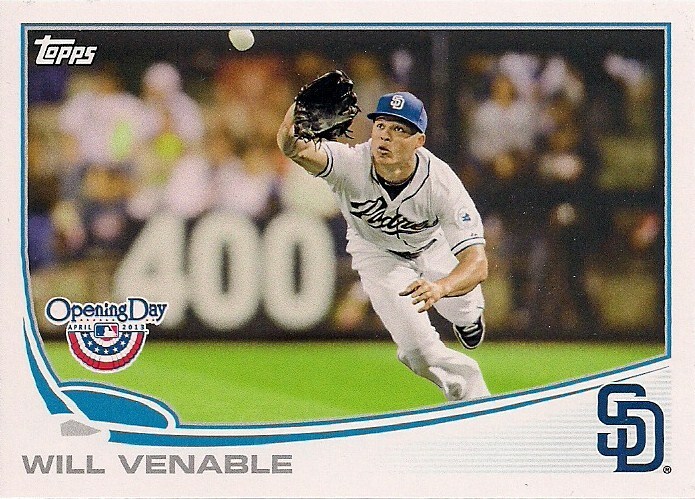 Venable merely looked like an '80s baseball nerd now. 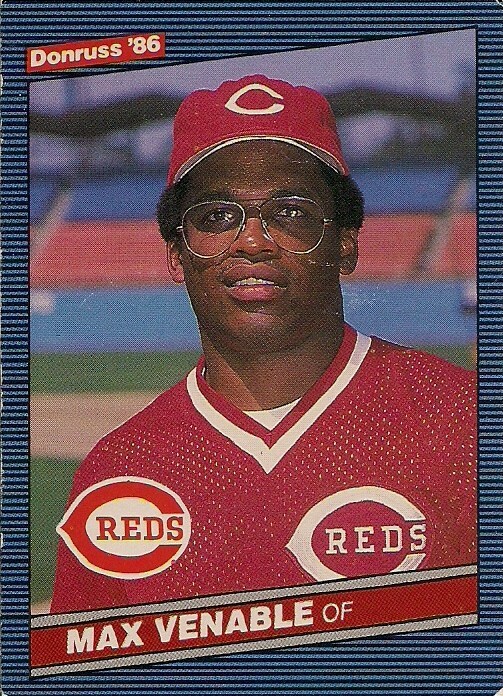 All of that base-stealing cred hidden by giant spectacles. I'm going to go ahead and blame the Giants for this one. I'm saying Venable had vision issues but the Giants were too cheap to spring for glasses and it took a trade to another club for Venable to receive those sweet Tootsie frames. This is the first time I'm seeing this, but the Reds logo is not a perfect curve on this card -- and probably other '87s, too. There are noticable bumps in it, like the Reds logo is growing a tumor. Anyway, Venable would disappear from cards again and not pop up until 1990. This time the glasses were gone -- no doubt replaced by contact lenses -- and in their place by one impressive mustache. 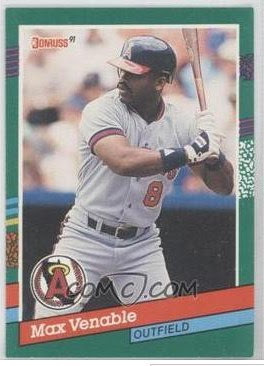 (Not one word about me not having a 1991 Donruss card and even fewer words about sending it to me). So that is the legacy that young Will must live up to on his cards during his career. 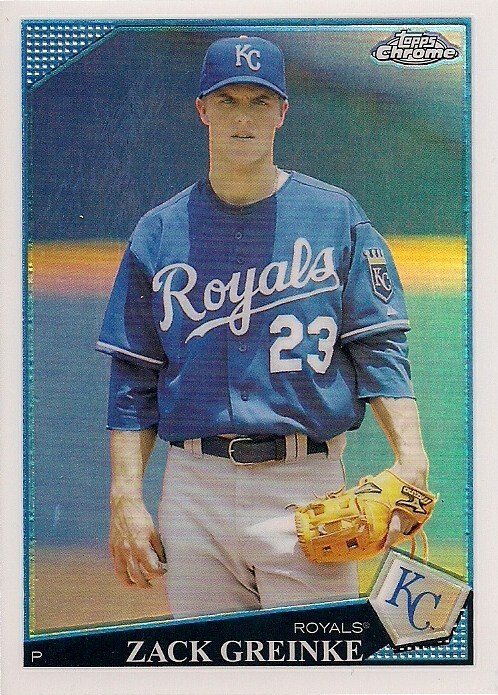 But he's off to a good start with a spot in the night card binder, booting a card I don't really care to own. Does it make the binder? : Yahoo! Yes. (If you want a card of Will Clark and Kenny Rogers hugging each other, inquire within). Jerry Seinfeld used to recite a very famous bit about rooting for sports teams. With the way players jump from team to team, fans of specific clubs, he said, are cheering for laundry. Uniforms, after all, are the only thing about a sports team that remains the same (and if you're a Diamondbacks fan, not even that). That's oversimplifying things, of course. Seinfeld forgets history and community and the quirks and nuances of individual franchises. But there is a point there. For instance, unless I'm building a set, I do not collect players who do not wear Dodger blue. 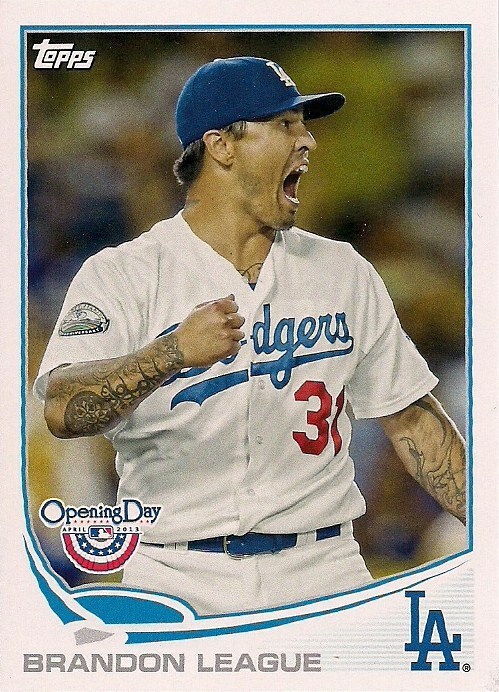 I have no desire to own cards of a player who isn't with the Dodgers unless it plugs a hole in Allen & Ginter or Heritage or whatever I'm trying to complete. Why else would I care about a Rockie? 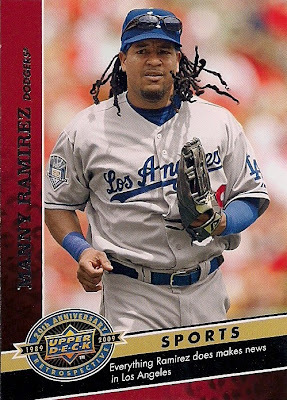 Sometimes, I see a player get traded to another team and then I'll read about a collector of that team who all of a sudden wants cards of that player with his old team. For instance, "Brandon League is on the Cubs now, I'll take all of your cards of League with the Dodgers!" (hey, I can dream). But I'm not a collector who does that. I've written about this before. 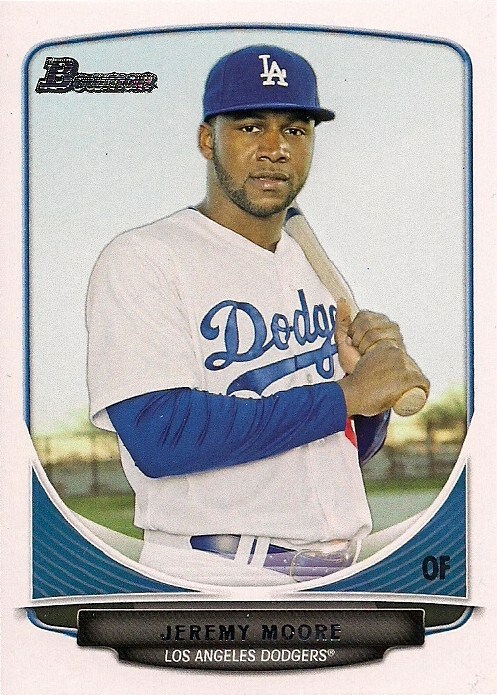 However, I do get cards of players who are on the Dodgers now who aren't on the Dodgers on their cards. It just happened when a package arrived from Cameron at Cardboard Heaven. He sent a little stack of Zack Greinke cards. 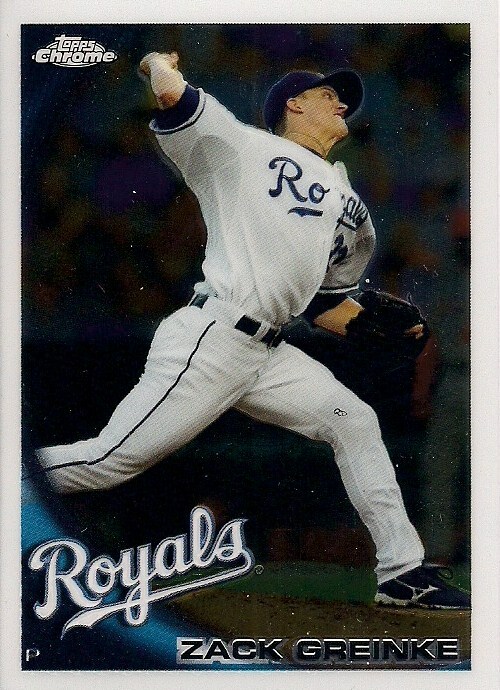 There were cards of Greinke with the Royals. 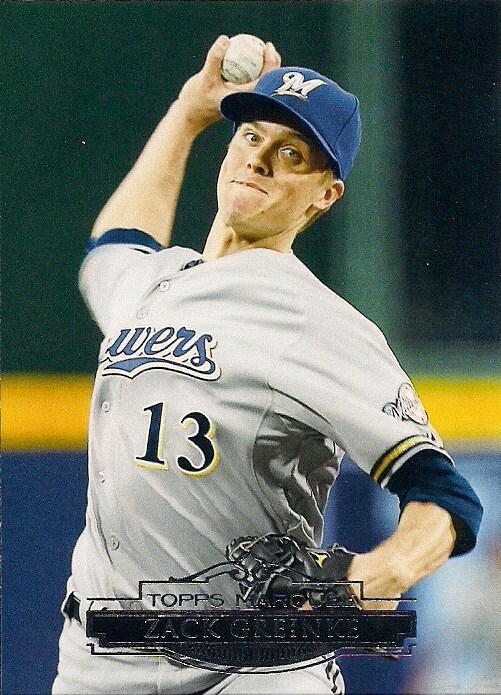 And cards of Greinke with the Brewers. I suppose if I was a Greinke player collector, these would be right up my alley. But even though I don't collect like this, I looked at these cards I received with appreciation. I like Greinke, now more than ever. And it's pretty cool to look back at his cards from pre-"before I cared about this dude." They have a certain novelty to them. But I think the novelty works only for the player prior to coming to your team. 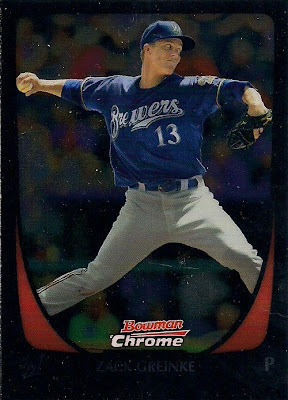 If Greinke should end up with another team down the line -- and it's likely because we all know that 90 percent or more of players are rentals -- there is no way that cards of him in his future teams' uniform will interest me. I'm not sure if that's some sort of irrational "traitor!" reaction or a "damaged goods" reaction. 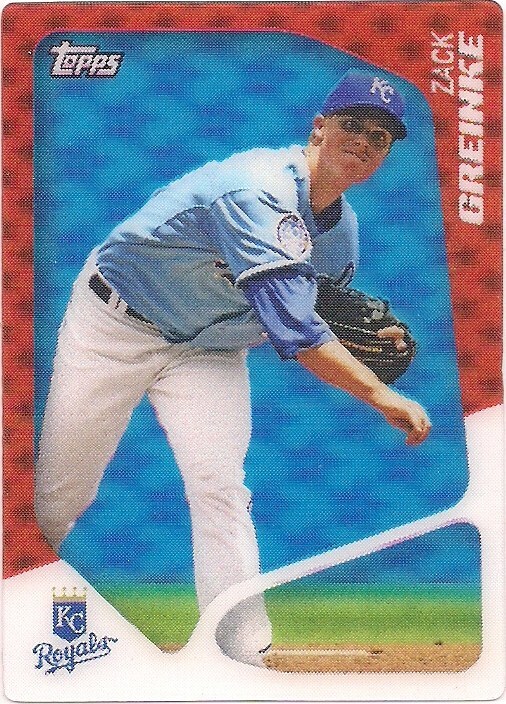 But that's the day my Greinke-card acquiring will end. 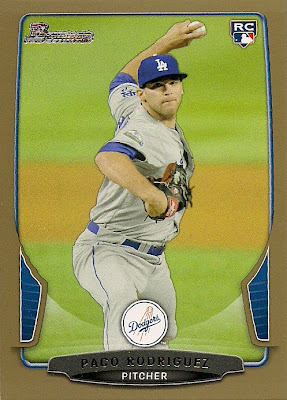 Anyway, those of you who come here to see Dodger cards will be relieved to know that I didn't just receive cards of Royals and Brewers in the package. Now, that's the best kind of laundry ever. Excluding the bikini, of course. Not much stood out from the Series 2 cards that I bought last week, other than the individual things I mentioned on the earlier post. But while leafing through those cards that I bought in what will be my only flurry of Series 2 purchasing, I did notice one thing that reminded me that I have noticed it before. A lot of sameness on the pitcher's mound. This has been going on for a few years now. After the mid-2000s, in which there were a lot of Topps base cards featuring teeny tiny images of players, the sets suddenly adopted a "get you close to the action" philosophy. Super tight shots of pitchers -- and batters -- in action. Lots of grimacing and gaping. I can appreciate that to a degree. It's just that it gets a little repetitive after seeing it year after year. Or, in the case of the hanger box that I opened, card after card. The first row of cards I pulled consecutively. 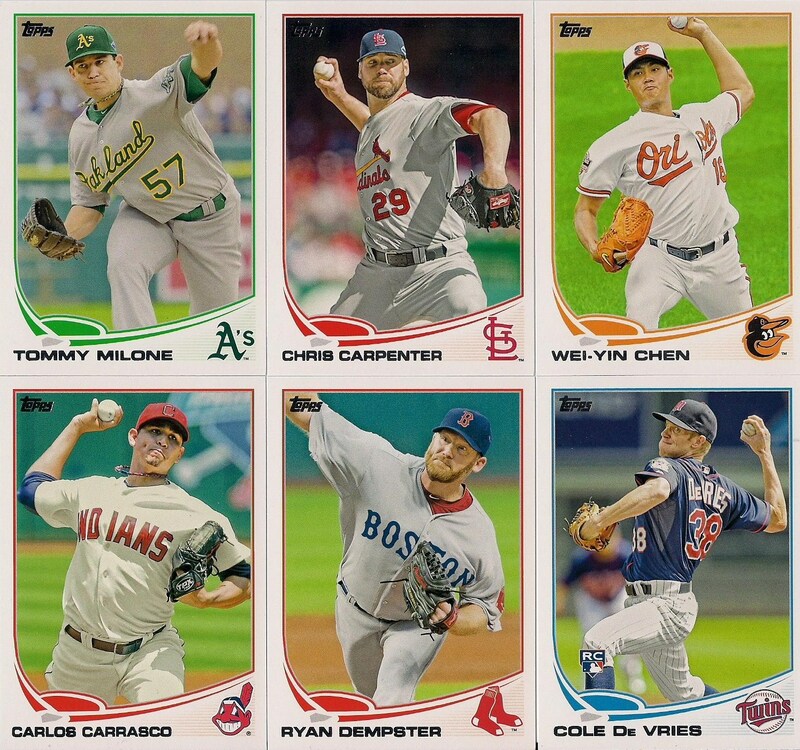 Milone, Carpenter and Chen all at various stages of wind-up. 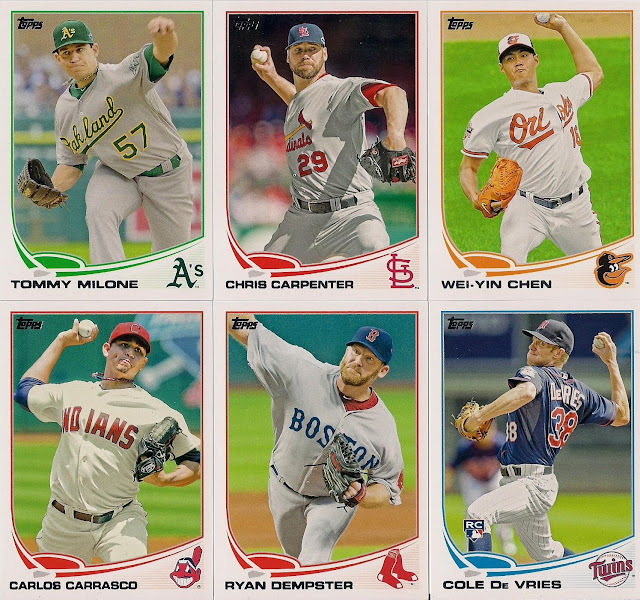 The second row of cards I pulled consecutively, as well. Carrasco, Dempster and De Vries each propelling a pitch plateward. I admit I thought "what is going on here?" And seeing the same basic shot repeatedly got a little boring. But there is a tendency, especially with people of my age, to view every new item as some sort of signal of the decline of civilization. "Back in my day" and all that. I am super conscious of this, and although I do believe that certain things were better 30 or more years ago, I try not to apply this viewpoint to everything. And I try very much not to do this with cards. 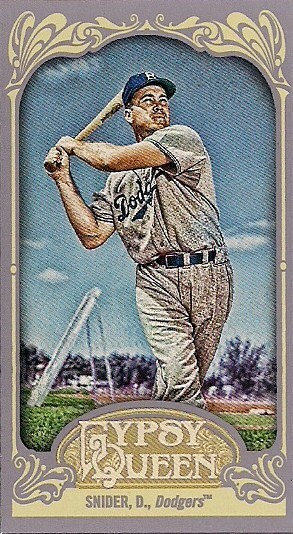 I know that there are decent things about cards today. If I bashed on modern cards incessantly, I'd be nothing more than a certain one trick pony that I know (and most of you know, too). I don't want to be like that. So I dug out my 1974 Topps set -- the first cards I ever witnessed -- just to see what I could see. That's not even all of them. We didn't mind this then. So why mind it now? I know I'm a hyper-critical 40-something adult who demands the very best in lots of areas in life. But sometimes, you've just got to put your instincts in check and wonder if every last thing on earth deserves to be analyzed with a critical eye. Can we let just some things be? I think we can do that a little bit with cards. At least I can anyway. Does that mean I'm going to stop being critical about current cards? Hell no. I've known cards for almost 40 years. I know what's good and bad. But I am going to pick my battles a little more carefully. Zoom in on the mound if you like. What can I say about Series 2?